Noah Syndergaard was a key part of the trade that brought R.A. Dickey to the Toronto Blue Jays. There are high hopes for the young pitcher and his early stats are showing great promise both on the field and in the hobby. 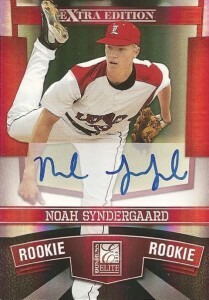 Collectors already have plenty of Noah Syndergaard cards to choose from. 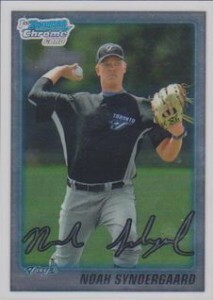 Shop for Noah Syndergaard cards on eBay. Now in the Mets organization, he stands 6'6" and weighs 240 lbs. Simply put, Noah Syndergaard has a dominating mound presence. This fireballer throws an intimidating fastball that approaches 100 miles-per-hour. 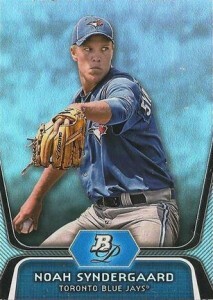 Drafted by Toronto in the first round of the 2010 draft, Syndergaard was the 38th overall pick. He was selected out of Legacy High School in Mansfield, Texas. Syndergarrd is showing a knack for winning. And while that can be a little misleading, his impressive strikeouts-to-walks ratio isn't. He is delivered everything the Mets were hoping for when they traded for him. Prior to the start of the 2013 season, he was Baseball America's 54th overall ranked prospect according to Baseball America. With his impressive performance his stock is already on the rise. Noah Syndergaard won't have any official rookie cards until after his major league debut. That said, he has appeared in several sets already. Below are some of the key Noah Syndergaard cards available already. A good starting point for any collector, this card would serve as the cornerstone of any Syndergaard player collection.Available in a multitude of serial numbered Refractors, the card features an on-card autograph. The non-autographed version serves as a nice companion piece. It's certainly more affordable. 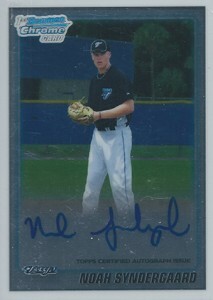 Like the autographed version, there are many Refractors as well. Serial numbered to 809 copies, the 2010 Elite Extra Edition Noah Syndergaard provides a nice alternative to the Bowman version. A little bit flashier, as it is printed on Panini's seemingly patented foil-board, it also features an on-card signature. 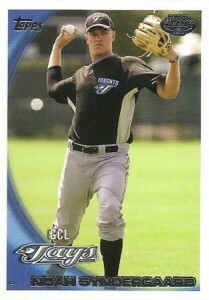 The card's image depicts the hurler in his classic follow through. This card is also available in a wide array of color parallels with varying serial numbering. A very affordable entry level base card, the Topps Pro Debut also comes in two parallel versions: Blue, which is serial numbered to 359, and Gold, which is serial numbered to just 50 copies. This is a beautifully designed base card from a mid-range product. Despite there not being an autographed version, there are several Refractors and printing plates to pursue. The majority of the refractors are serial numbered.